Earlier in the day, the French authorities have launched an investigation into the disappearance of Interpol President Meng Hongwei in China, Europe 1 reported on Friday citing sources. Interpol President Meng Hongwei, who has been reported missing earlier, is under investigation in China, the newspaper South China Morning Post reported on Friday citing a source. According to the newspaper, the official, who also serves as the Chinese deputy public security minister, was taken for interrogation soon after landing in China a week ago. The French newspaper Le Monde reported that Meng's place of detention is being kept secret. Earlier in the day, the Europe 1 broadcaster reported that an investigation into the disappearance of Meng, who left France for China on September 29 and hasn't been heard from since has been launched by French authorities. Following reports, Interpol has commented in a statement on Meng's disappearance stressing that the whereabouts of the Interpol official was "a matter for the relevant authorities in both France and China." 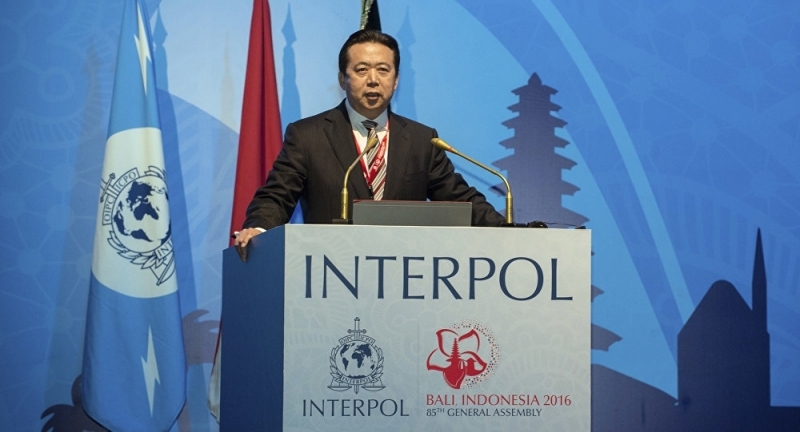 Interpol's press office has further noted that the organization's secretary general, not Hongwei, was in charge of Interpol's operation. The official's wife, who resides in Lyon, the same city where Interpol is headquartered, informed the police about his disappearance. Meng assumed office in November 2016. He has held various positions within China's Ministry of Public Security in his decades-long career. According to Interpol's website, Meng Hongwei served as Vice Minister of Public Security in China.